The two female soldiers graduating from the Army’s elite Ranger School have been revealed to be First Lt. Shaye Haver, 25, and Capt. Kristen Griest, 26. They are scheduled to officially graduate from the grueling two-month course on Friday. A group of the graduating soldiers, which included Haver and Griest, met with reporters to discuss their experience with the course, reports USA Today. “We kind of were winning hearts and minds as we went,” said Hayer. “Every single time that we accomplished something, it gave us that extra foothold,” she said. One night, staggering under a heavy load, he asked his squad mates if they could help carry some of his equipment. Most stared blankly at him. Only Haver volunteered, taking some of the load from Janowski despite her own exhaustion. That ended his skepticism, he said. So much respect for these two. 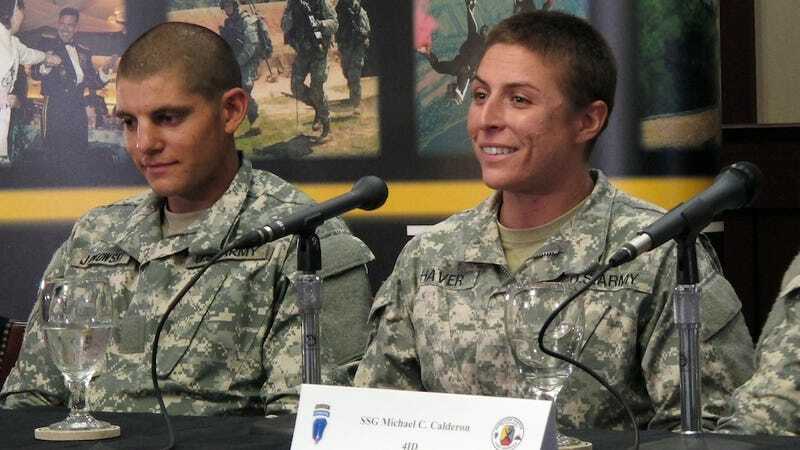 Although Haver and Griest’s completion of the course is indeed a historic moment, the Army has yet to decide whether they will allow women to serve in special operations in the future. Women are currently not allowed to serve in Ranger regiment. The United States Navy, however, is planning to allow women to join their SEAL teams. Image of Shaye Haver via AP.